Synonymous with luxury lifestyles, Nations Trust American Express Card takes pride in bringing forth distinctive and memorable experiences for their Card members. As the official ‘Fashion Card’for the third consecutive year, Nations Trust Bank American Express partners with Fashion Week Colombo for Swim + Resort in its latest edition that will showcase luxury resort wear. Scheduled to take place from 4 – 7 July at the luxurious Shangri-La Hotel, Colombo , this year’s Fashion Week edition, aptly themed Swim + Resort, bases itself on showcasing luxury resort wear as well as being a global platform for sustainable swimwear. Nations Trust Bank prides itself on being a bank that drives several sustainable initiatives towards conservation, and a global initiative such as this encourages the fashion industry to be sustainable and responsible. Having being initiated in 2016 with a focus on swimwear and resort wear, it has now redefined its focus to the growing segment of luxury resort wear. It is the nurturing platform for aspiring swimwear designers and manufacturers to showcase their collections and establish their brands alongside established international labels. Partnering for a third successive year, Nations Trust Bank strongly believes in the potential of Swim + Resort giving Sri Lankan designers the opportunity to showcase their work on a global platform and for international designers to further their presence in Sri Lanka as well as the Asian region. “There is a growing interest in luxury resort wear around the region that also translates into consumption by discerning fashion consumers. The ‘Fashion Card’ by Nations Trust Bank becomes an enabler to that group. 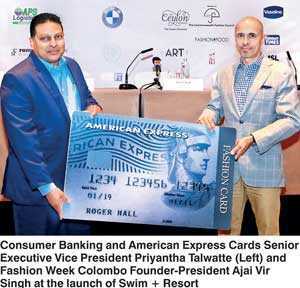 We are pleased to have Nations Trust Bank American Express on board for the third year and we hope that this journey of development will continue,” said Fashion Week Colombo Founder-President Ajai Vir Singh. As a brand that strives to deliver the best in service and personal recognition, and to provide benefits and privileges to facilitate the luxury lifestyle of Card members, the events lined up during Swim + Resort will go hand in hand with the Nations Trust American Express promise to their Card members. The runway shows planned for this season will feature the latest collections in luxury resort wear and swimwear fashion, designed by five renowned international designer swimwear brands. Furthermore, the Fashion Week Emerging Designer Showcase will introduce the collections of seven promising designers. Nations Trust Bank PLC is amongst the top 30 business establishments in Sri Lanka, ranked by Business Today Magazine, and is the benchmark for customer convenience, ably providing a host of financial products and services to a wide range of customers. Nations Trust is also the bank behind Sri Lanka’s first fully digital banking and payments platform, FriMi. The bank operates 93 branches across the country, boasting an ATM network covering 139 locations plus more than 3,500 ATMs on the Lanka Pay Network, and is the issuer and sole acquirer for American Express Cards in Sri Lanka.